Fully 25% of the land in Costa Rica is protected in some way. The government really is committed to keeping their natural ecosystem and beauty intact. 100% of their electricity is produced using hydro and wind power. They are no longer dependent on oil. Healthcare is excellent and low cost. Cost of living is about 30% lower than the US. They have no army. Instead, they invested in education for all of their citizens including the poorest. Can you imagine that? A number of studies on happiness have ranked Costa Rica as the happiest country on earth. People care about each other, have close ties to family and community, and have expectations of a stable government, living wage, decent healthcare, and inexpensive food. A strong community of both Costa Rican natives and expatriates. Community is really important to us – we want to be a part of a vibrant, living, and joyful community. Access to outdoor recreation including hiking, birding, kayaking, rafting, horseback riding, and swimming. 4 days at Playa Hermosa, resting, swimming, sailing, snorkeling, bird watching, looking at property and meeting people. 2 days at Tamarindo, swimming, filing police reports, waiting for rental car repair, looking at property and meeting people. 3 nights at Living Forest and 4 nights at Chalet Nicholas near Nuevo Arenal, yoga, bird watching, hiking, hot springs, zip-lining, looking at property and meeting people. We flew into the Liberia airport in the Northwest area of the country - the Guanacaste region. Our first stop was four blissful days at Playa Hermosa. Hotel Velero is literally on the beach. 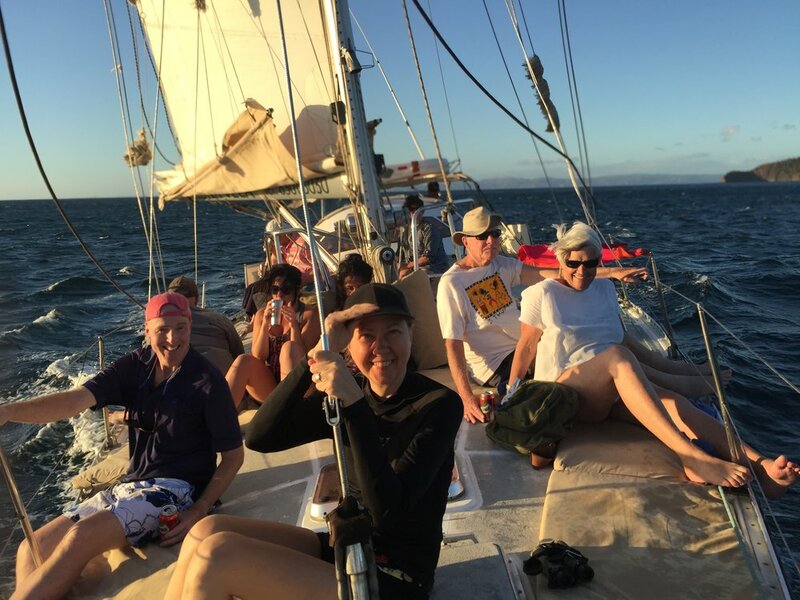 The hotel arranged an afternoon sail out on the Pacific - in a small craft advisory! There was a party to raise funds for monkey bridges. As land is developed near the town, there are not enough contiguous trees for the monkeys to travel, so they use power lines and get electrocuted. The locals put up bridges between trees to reduce this. There was an amazing artist who painted the large painting you see in the background and auctioned it off at the end of the night. Great tailed grackle are sort of like the crows of Guanacaste - they were everywhere stealing food off of tables, picking through the leaf litter for bugs, and generally providing entertainment for us idle folk. The females are lighter brown in color, so it was easy to see the mated pairs. Howler monkeys woke us up each morning with their low pitched howling and hooting. A troop of them frequented a tree near our hotel. This little guy was so cute! Howler monkeys are primarily leaf eaters, so they're pretty slow moving. The Rufous-naped Wren was common around our dining table, and had a very pretty song. I never knew the white winged dove was so beautiful. I think that’s a Kiskadee in the background, you here hear them everywhere with their distinctive Kiskadee call. The Magpie Jay has a spectacular tuft of feathers on his (or her) head. This rather large iguana was roaming around the pool area. The Variegated Squirrel did the usual squirrel things, but with perhaps a bit more style. I could watch the Brown Pelicans flying in formation and diving for fish all day. A Royal Tern on his way down for a snack. After 4 days at Playa Hermosa - we were in LOVE. We thought “Hey, we could easily live here. But it’s our first stop? !” Time to head on down the coast. We passed through Ocotel, Playas Coco, Playa Panama, Playa Grande, and many other beaches. We spent the next 2 nights in Tamarindo. My camera was stolen from the back of our car - while we were sitting 20 feet away on the beach at Playa Conchal. I KNEW that I should NOT have taken it out of the back to photograph some parrots, but I thought no one was looking and I surreptitiously removed it, shot some photos, and replaced it in the back of our car under the security screen. When we returned to the car 30 minutes later, the rear window was smashed, and the camera was gone. So the rest of the trip has fewer and more mediocre photos taken by my iPhone. 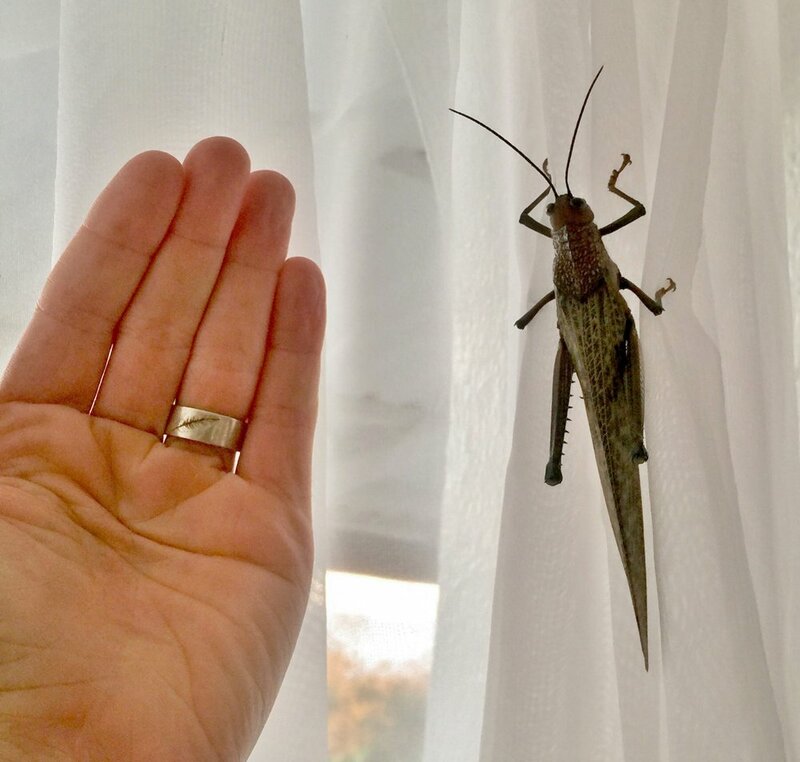 So the bugs here are big. Dinner at the Hotel Lagarta Lodge in Nosara, with the most romantic sunset you can imagine. Off to our right is the estuary where we would be kayaking the next day. 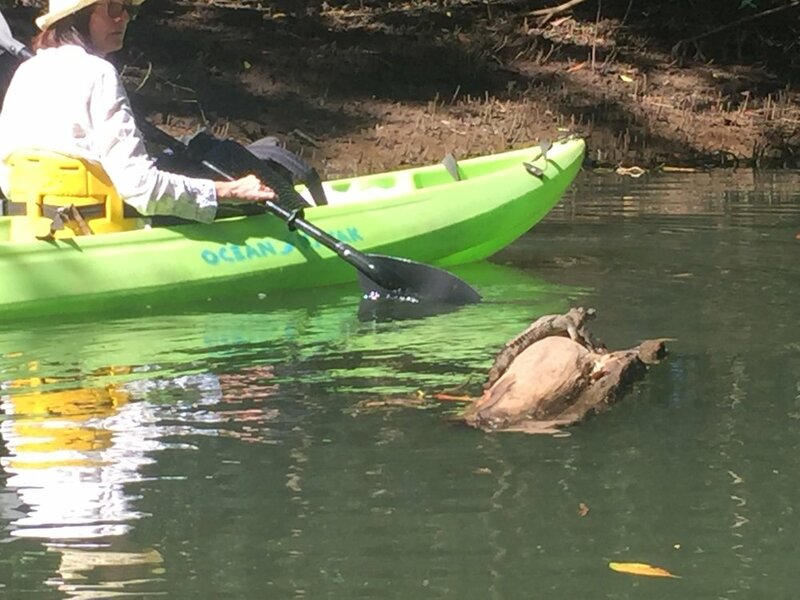 Kayaking in the Nosara estuary. Birds galore! But alas, no zoom lens, no real camera. Okay, here's a baby crocodile. And where is mom and dad? Makes me question the wisdom of taking a swim earlier, even though they said it was okay. I'm not sure if the light is coming from Sharon or going to her, but either way she's the light of my life! A wonderful local guide named Gabrielle took us horseback riding. She was quite knowledgeable about the ecosystem. After Nosara, we headed down the coast to Samara, stopping at beaches along the way. We spent a few nights outside of Samara, which we really enjoyed. The town has a nice Costa Rican laid back beach town vibe, not too touristy, but still plenty to do. From Samara we headed inland to take a hiking and bird watching boat trip in a national park. Then on to Lake Arenal, where we spent the next 10 days or so staying at Living Forest and Chalet Nicholas. Feeding the Aracaris at Chalet Nicholas. I think these are the craziest looking birds with that gigantic beak and it’s sawtooth pattern. We visited a lot of potential building sites. This one had a stream that we just had to explore. 3 acres near Lake Arenal. I wish I knew more of the trees here, but many of them have this “buttressing” to better support them in the shallow topsoil layer. Kind of a washed out picture, but I wanted to include this as it is the view from our favorite piece of land for the whole trip. It’s 7 acres backing up to the Tenorio national Park, with the Aguacate River on one side, and a rough road on the other. Lots of wildlife, birds, protected from the prevailing winds, nice views, and private. We’ll see if this is our new home! A day trip to Rio Celeste, in the Tenorio National Park. The unusual green/blue color is due to combination of two different streams containing minerals from the volcano and combining together. At the point where they combine the river turns blue. By the time it gets to these falls, it’s changed to a bit greener. Now we’re off to the Monteverde Cloud Forest, which has an AMAZING story. In fact, it’s kind of the story of how Costa Rica became so environmentally responsible and a center of eco-tourism. Some Pennsylvania Quaker pacifists were thrown in jail in 1948 for refusing to comply with the draft. After they got out of jail, they took their families and moved to Costa Rica where they started a dairy farming and cheese making community, which they named Monte Verde, or green mountain. A visiting professor was impressed with the great diversity of bird and animal life, word got around, and birders from all over the world started flocking (hah) to Costa Rica for the bird life. Partnerships between the Quakers, educational and NGO institutions, and the Costa Rican government preserved lands, attracted more eco-tourists, and the industry grew to the point where it’s now about 5% of the GDP. And that protection of the environment is why we are considering moving there. The ever lovely Motmot. Apologies for the poor picture quality - I’ll be replacing my camera when we return! This Capuchin monkey was expecting a handout. An agouti on the path. In the cloud forest at Monta Verde. Old-growth looks different down here. We returned to Playa Hermosa and the Velero Hotel for the last few days of the trip. I finally felt like I could completely relax – all of the real estate searching and trip planning was done, but here it was the last day! Sharan and I really enjoyed Costa Rica, and can definitely see ourselves living here in the future. We are already planning our next trip for October, and look forward to moving further along in our exploration.